Administered prices and subsidy policies have landed the fertiliser industry in trouble. It is time to decontrol and unshackle. With the implementation of the nutrient-based scheme (NBS), the prices of di-ammonium phosphate (DAP) and muriate of potash (MoP ) have gone up to almost four times the price of urea. As a result, farmers are overusing urea. The fertiliser subsidy is budgeted at Rs 72,970 crore for 2014-15. There are also pending bills of Rs 30,000-35,000 crore that need to be cleared on account of this subsidy. Together, it amounts to more than Rs 1 lakh crore, more than 10 per cent of the Central government’s tax revenue and a substantial pressure on the fisc. Almost two-thirds of this subsidy comes from the unduly low price of urea, which is priced at Rs 5,360 per metric tonne (about $86 per MT at an exchange rate of Rs 62 to the dollar). Globally, prices hover around $300 per MT, although country-specific prices vary widely. In China, for example, the price is $265 per MT, in Pakistan $362 per MT, in Bangladesh $207 per MT, in Indonesia $148 per MT, and in the Philippines $462 per MT. The Indian urea price is perhaps the lowest among large economies. This has led to the misuse of urea, which is being diverted to non-agri uses and smuggled to neighbouring countries. There are no firm estimates of this, but insider guesstimates vary between 10-20 per cent of the urea distributed in the country. Against the generally desirable N:P:K (nitrogen, phosphorus and potassium) use ratio of 4:2:1, in Punjab and Haryana, the ratio was 62:19:1 in 2012-13. This reduces the grain to fertiliser response ratio, leading to much lower returns from fertiliser applications. The rising subsidies and delays in the payment of these subsidies to specific plants have created an environment of uncertainty in the fertiliser industry. As a result, domestic investment in the fertiliser industry has lagged and imports have surged. 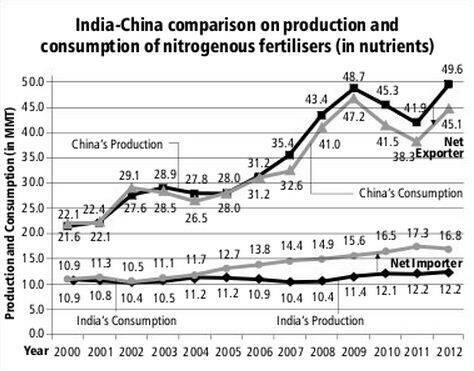 For example, between 2000 and 2012, while Indian domestic production of nitrogenous fertilisers increased marginally from 10.9 million metric tonnes (in nutrients) to 12.2 MMT, China moved from 22 MMT to 50 MMT (see graph). India has landed its fertiliser sector in a mess: rising subsidies and imports, lagging investment, highly imbalanced use of nitrogen, phosphorus and potassium, and diversion of urea to other countries and non-agricultural uses. This is largely a result of administered pricing and subsidy policies. How can the Indian fertiliser sector be brought on track? Raising urea prices by, say, 200 per cent seems an obvious choice. But if it was so simple it could have been done long ago. Several committees have recommended a price increase but this has not been accepted by successive governments. Politically, it does not seem feasible that urea prices could be raised by 200 per cent in a single shot or even over a three- to five-year period unless accompanied by a substantial increase in the MSPs of basic staples like wheat and rice. Take the case of Pakistan and China. While their urea prices are way higher than India’s, they also offer much higher MSPs for crops. In Pakistan, the MSP for wheat is $320 per MT and in China, it is $385 per MT ,against India’s $226 per MT. The fertiliser cost in Punjab accounts for about 7 per cent of the MSP of wheat. If one adjusts for this, the Indian farmer is at a much disadvantaged situation. If the price of urea is raised by more than 200 per cent, taking it from $86 per MT to, say, $265 per MT — which is the price Chinese farmers are paying — but the MSP of wheat is also raised from $226 per MT to $385 per MT (what the Chinese farmer gets), or to $320 per MT, which his Pakistani counterpart gets, the Indian farmer would be more than happy. So, there is a way to make the price increase politically palatable. But given the National Food Security Act, 2013, which promises wheat and rice at Rs 2 to 3 per kilogramme, this MSP rise will lead to an explosive growth in food subsidy and a further distortion in cropping patterns, skewed in favour of wheat and rice. India may end up worse off. Another option is to simply transfer the cash equivalent of the current fertiliser subsidy to farmers. This works out to roughly Rs 5,000 per hectare (Rs 1 lakh crore subsidy divided by gross cropped area of about 20 crore ha). Farmers below the 4 ha holding size can be given cash at this rate and those above that holding size at Rs 4,000 per ha. Then the entire fertiliser sector can be deregulated, with imports flowing freely at zero import duty. Direct cash transfers can be conducted via Jan Dhan Yojana bank accounts and linked to the UID and Aadhaar. Politically, this is feasible and will lead to savings of at least Rs 10,000 crore in the fertiliser subsidy by simply stopping the diversion of urea to other uses and smuggling to other countries. It will also signal to farmers that they use nitrogen, phosphorus and potassium in a balanced manner, raising the productivity of fertiliser use. The only condition imposed on beneficiary farmers should be that they get their soil tested every three years. What would happen to our fertiliser industry under this brave new world of total decontrol? The probability is high that it would expand and prosper, provided urea plants are given gas at a uniform price (maybe a pooled price of import parity and domestically produced). It will incentivise them to be more energy efficient, get the best technologies and compete with those in China or elsewhere. There could be mergers and acquisitions within the urea industry, but overall, the industry will be liberated and unshackled from myriad controls. Industry captains today feel they are ready to walk this path to freedom. Is the government also ready?